The "Take It" came from a near brain implant viewing of the magic of Sparkles shared in a photo displayed last year. There is just something on the edge of unreal to me what this glimmer does in the way of enhancing any water photo. In this one, the boys on their boogie boards were impossible for me not to sit and watch. Their play in the surf was what I believe every child should have if at all possible as a part of their growing up experience. There is just something that is imparted into the mind with this wonderful form of play. The go do it again, matched up with satisfactions from a great ride seem to obliterate fatigue.The knowledge that there is potential for the best ride being yet to come blends with those great ones already taken for a wonderful sense of satisfaction. There has been much written about surfing, but it never ceases to delight me either as a lifelong participant, or in this instance as an observer. 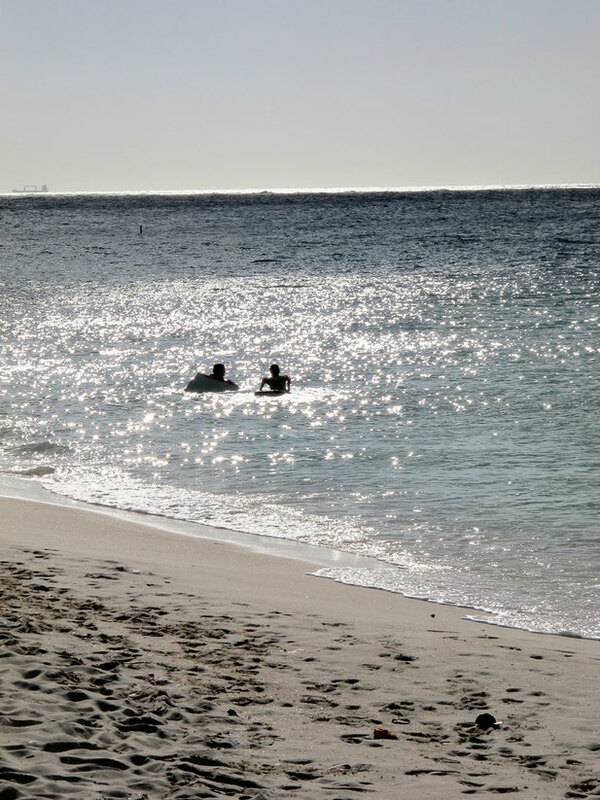 While the sparkles washed over them in the warm ocean, here is hoping they somehow do over you as well like they do over me each time I look at this gentle picture of youth at play. The After Take: When I show this picture to others, it is almost always met with no words being spoken. The eyes of the viewer speak volumes. For what reason I do not know, I have chosen to not pursue the thoughts of the viewers, rather just let them take a private moment with the only sharing being the chance to observe for a fleeting moment, that look in their eyes. Thank you for sharing in the magic. Mid January and kids are swimming in 80 degree water, unheard of!!! Such a peaceful photo. Many people this time of year would gladly trade in the snow boots and parkas for a boogie board and some flip flops. Count me in!